After a weekend of decadent eating (read: a Tommenator followed by Morelli's Ice Cream! ), it was definitely time for Meatless Monday. 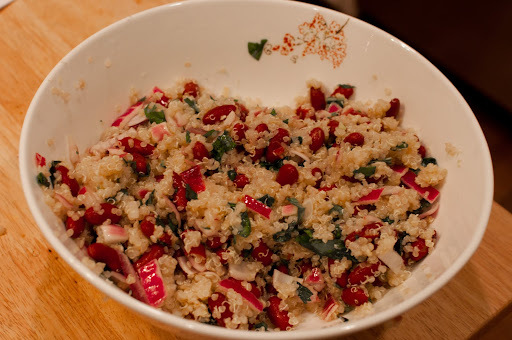 I had never made quinoa before, but I picked up some at Costco and found it easy as can be. I'm almost ashamed to admit where I got this recipe. Food snobs like me often scoff at Rachael Ray for being both a hack and mightily annoying. But I read the April issue of her magazine courtesy of my mother-in-law and was amazed at how much I picked up from it. Consider me a reformed hater, sort of. And how timely, NY Times covered quinoa this weekend. Who knew it was all grown in Bolivia? I feel bad that we're eating all of their quinoa, but I feel good that I'm eating something good for me. Ooh too much thinking for Monday night, that's an ethical dilemma for another time!